Mary brings exceptional credentials and experience in energy efficiency and electric utility businesses. She further deepens KSV’s energy efficiency and connected home marketing expertise. With great pleasure, I was able to sit down with Mary and discuss the energy industry, its transformation and the critical role of communications. Watch an outtake here. And Part I of the interview below. 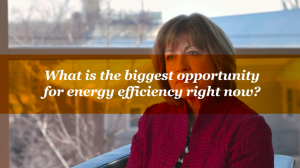 LB: What do you see as the biggest opportunity for utilities/our industry right now? MS: Break down the silos and make it easier for customers to participate in programs. Deliver high quality, turn-key services that combine offerings across the energy efficiency / demand response / renewable energy product suite. Cross-sell what is available and relevant to customers’ homes and businesses. All in all, we need more, better, targeted and personalized communications. There is also a huge opportunity to look at other products, companies and industries where there has been great transformation. What can we learn from them? Think Amazon and Uber. Spotify. Fitbit. JetBlue. We need to connect the incredible innovation that is happening in this industry with the business owner on Main Street and the consumer right there at home. LB: What are the most important attributes of successful E.E. programs? Make it easy for customers to participate. Challenged with low customer engagement, participation, sales or satisfaction?Get in touch. We'll work together on the solution.